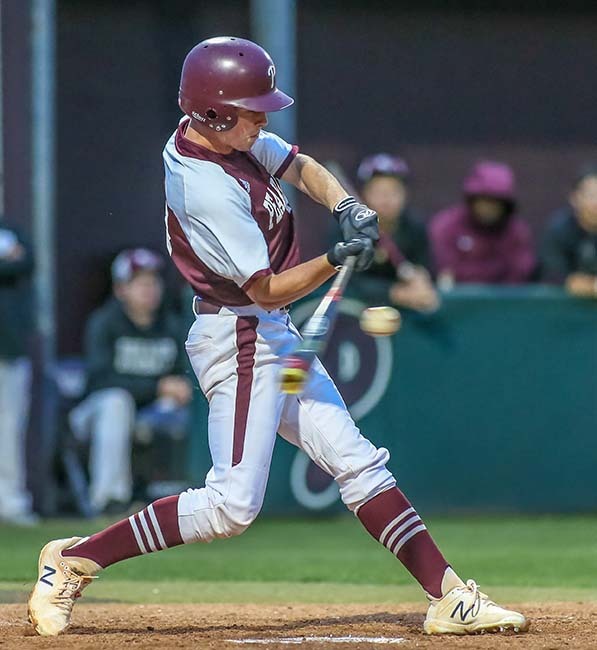 PEARLAND — It took 12 innings to decide a winner between the Pearland Oilers and the George Ranch Longhorns, but the game was finally decided 1-0 in favor of the Oilers in a District 23-6A showdown. Pearland got a sterling pitching performance from three hurlers that allowed only two hits and no runs. Matt Adams pitched seven innings while allowing two hits, no runs, while striking out 10 with only one walk. Ray Castro stepped in relief and pitched two innings allowing no runs, no hits, and two walks. Clayton Broeder pitched the final three innings and allowed no runs, no hits, four strike outs, and two walks to pick up the win. Pearland got the winning run in the bottom of the 12th when Parker DeLeon reached base on a one-out error. Cole Smajstrla worked the George Ranch pitcher for a walk that moved DeLeon to second base. Christian Terranova laid down a sacrifice bunt that moved the runners to second and third base with two outs. With a 1-2 count, Mason Lytle drilled a single to centerfield that sent DeLeon across the pay station with the winning run for a 1-0 Pearland victory.